In my previous post, I explained a bit about how whole life insurance works – in particular trying to explain the idea of “cash value” and where it actually comes from. (Something that both the industry and critics get wrong, with just one exception that I’ve found.) This explanation was sought out and brought on by interest in the Infinite Banking Concept (IBC) or Bank on Yourself (BOY). The basic idea: when structured carefully, a whole life insurance policy can be used as a savings instrument that can replace your need to take loans from banks. It’s really that simple. Now, let’s get into the “how” and “should I”? As I previously explained, whole life insurance policies build up a cash value – which is basically a buyout offer from the insurance company to get you to cancel your policy so they can avoid paying the large death benefit. In order to maximize that buyout offer, you need to carefully structure your life insurance policy so that it’s worthwhile to buy you out quickly. How you do that: structure things so that you pay the premiums early in the policy. At the extreme end, you would buy a “paid up” policy where you only pay once. And, this policy DOES build up cash value fastest. If you wanted to invest, say, $1000 per year, buying a paid up policy each year would build up cash value MUCH faster than getting a basic whole life insurance policy with a $1000/yr annual premium. But, there’s a catch: taxes. For whatever reason, the government has decided that earnings in life insurance policies shouldn’t be taxed as long as you don’t access them until late in life (or after death…). This is a handy benefit. HOWEVER, the government has also decided that paid-up insurance isn’t REALLY insurance. It’s just an investment – called a “modified endowment contract” or MEC. So, using the “buy a paid-up policy each year” plan would result in negative tax consequences. (1) Start with a standard whole life insurance policy with a smallish death benefit. (2) Tack on a Paid-up Additions Rider – in effect, this rider lets you ADD paid-up insurance to your standard policy. As long as the proportions are right, since the tax man analyzes the policy AS A WHOLE (basic policy PLUS the riders), this can allow you to build up cash value more quickly than the basic policy would while still avoiding the negative tax consequences of an MEC. (3) Tack on a Term Insurance Rider – this increases your death benefit for fairly cheap. Since the MEC determination is based on a comparison of your premiums vs. the death benefit, this rider allows you to put MORE into paid-up additions. Eventually, you can let this rider expire if you follow the Bank on Yourself method. The dividends you get from the whole life insurance policy will build up your death benefit to the point where you don’t need the term rider to allow the larger paid-up additions. Sound complicated? That’s okay. This is why Infinite Banking and Bank on Yourself recommend that you NOT try to cobble this thing together on your own. Instead, both are assembling teams of agents who are trained in their techniques – which are pretty similar to each other, as far as that goes. And, unfortunately, life insurance is so highly individualized that you kind of HAVE to talk to an agent about your case. (Or is it just me that hates to talk to people trying to sell me things?) I’m just laying out the basics so you have some clue what’s going on. (2) you can borrow from the insurance company, using the cash value as collateral – this allows the cash value to continue accumulating and does not sacrifice death benefit. If you happen to die before you pay the loan off, then the insurance company will subtract the amount of the loan from the death benefit. This option allows you to use the FULL cash value now (at least as I understand it…) – not just the premiums that you put in. Of course you have to pay it back, or the interest (interest rate 8% from what I’ve seen) may accumulate to the point where the insurance company cashes in your policy for you to make sure the loan gets paid. Basically, like with a bank, you can withdraw money from your account without putting it back in – it just means it’s not there in the future. And, like with a bank, if you don’t pay the loan you might lose the collateral. Policy loans are just a LOT more flexible than bank loans. The problem I ran into: I like to analyze things myself without a sales person looking over my shoulder. So, I didn’t want to contact a trained agent to ask about the details for one of these policies. I would probably end up feeling guilty enough to buy one if I did that, just because they invested their time in talking to me. But, life insurance companies seem to keep information about their policies under lock and key. It’s VERY hard to get the detail I wanted without giving them my phone number so an agent could call me. (Something, by the way, that is RIGHT THERE in the fine print on the website – that I’m agreeing to have agents call me when I ask for information.) Since the structure of these policies is a bit complex, I couldn’t analyze them exactly. But, I found something that could get me close. State Farm has decided that it might actually be worthwhile to provide some detailed information to people WITHOUT forcing them to give their contact information. So, I could run some scenarios through them. Awesome. EXCEPT that they don’t let me tailor things in the IBC/BOY way. To be fair: IBC is less restrictive than BOY in terms of the policy structure, based on my limited understanding. It’s more a philosophy of how to structure these things. Some IBC advocates point out that a 10 pay policy (in which you pay premiums for just 10 years to get the death benefit for life) does a reasonably good job for IBC purposes. It satisfies the tax man’s definition of insurance, AND it builds cash value reasonably quickly. Best of all – I could actually get information about it from State Farm. From State Farm, I could use 2 values: the “Guaranteed Cash Value” (which assumed zero dividends) and an “Illustrated Cash Value” (which assumes reasonable, but certainly not extravagant, dividends). The next choice I had to make: what should I compare this TO? I mean, it’s fairly obvious that, as long as the cash value eventually exceeds the total premiums I paid, it’s going to beat my savings account at my bank – which literally pays 0.1% right now – over the long run. That’s hardly a necessary comparison. So, I took a page from Pamela Yellen of BOY. She seems to advocate (I’ve not finished the book, so I might be wrong here) replacing a 401(k) with a BOY policy. So, the obvious point of comparison would be stocks – or, more properly, a stock/bond mix like you might use in a 401(k). Personally, I think a Roth IRA is a reasonable comparison. It has a lot in common with these policies. Earnings are tax-free, as long as they’re invested until you’re old enough (59 1/2). AND you can withdraw anything you put in without sparking tax consequences. The Roth has 2 restrictions these policies don’t: (1) You can only put in a set amount each year (for me, $5,500 for me and $5,500 for my wife). (2) You can’t borrow against the earnings. So, keep that in mind. (1) I looked up a 10 pay policy from State Farm for $100,000 (the smallest they offer of that policy type). Premium for me: $2784/yr. (3) I subtracted $2784-$216 (the premium for the term policy) – $20 (likely annual commissions in a Roth account that is rebalanced once a year using TDAmeritrade). Putting together 1-3, I’m assuming “buy term and invest the difference”. So, $2784 is going into the 10 pay policy in the one case, and $2784 is going into buying a term life policy ($216) + commissions ($20) + Roth contributions ($2548) in the other. This is for the first 10 years. After that, I’m assuming that the Roth IRA cashes out $216 per year to pay the term life premium. I assume that the investments in the Roth will be a bit aggressive. 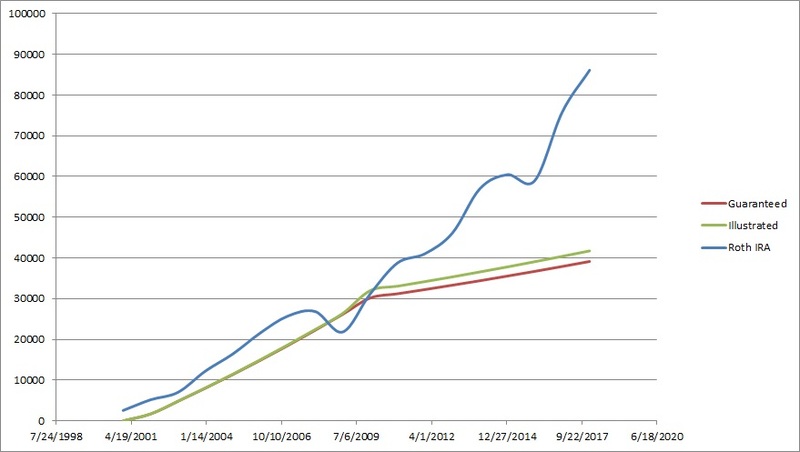 80% small-cap stocks (using the IJR ETF), and 20% in a boring bond fund that just pays 3% per year with no price volatility. (3% is the dividend yield on BND right now. BND isn’t old enough to fit my whole time frame, so I just assumed that bonds were held until maturity and earned 3% per year.) The Roth is rebalanced each year to ensure an 80/20 allocation. Also, because I assumed ETFs were used I don’t have to worry about any hidden expenses. For time frame, I went back as far as I could. Turns out IJR has existed since 2001. This is GREAT – because it means we’ll capture BOTH the tail end of the dot-com burst (which was not good for small caps) AND the subprime crisis. So, we’ll see both a fairly “standard” stock market crash associated with a mild recession, AND a major “worst since 1929” crash followed by a prolonged, deeper recession. In the early years the Roth outpaces the insurance policies – even through the tail end of the dot-com burst. The Roth keeps going up because of the contributions being made in this time, which are large enough relative to the existing balance to offset the losses. At the end, the high average returns of stocks (especially small cap stocks) lead the Roth to outpace the insurance policies by quite a bit – so you end up with about 2x as much money at the end of this time as in either of the life insurance scenarios. The only time frame where you should say “Oh, I’m so glad that I followed the insurance plan rather than the Roth plan.” is in 2009 – which reflects that the market collapsed amidst the financial crisis in 2008. But, the recovery was so fast that by as early as 2010, the Roth was ahead again. In terms of total value, it’s pretty clear that the Roth wins in the long run. However, in terms of ACCESSIBLE value, it loses (as long as you’re not 59 1/2 yet!). The Roth had $25,480 go into it that can be withdrawn without tax consequences. Of that, $1,888 HAS been withdrawn to pay for the term life insurance – so only about $23,500 can be accessed without sparking tax consequences. Meanwhile, of the $39,130 in the Guaranteed Cash Value in the life insurance, fully $27,840 can be withdrawn without having to repay AND without sparking tax consequences. OR the entire amount can be borrowed. “BUT WAIT!” an IBC/BOY advocate may say. “Look at the roller coaster that is the Roth! If things had ended in early 2009, then IBC/BOY would have won.” I absolutely do not deny that. The issue is that, over the long term, 2008-2009 happens, but doesn’t stay around forever. Stocks do recover. So, their average return is what matters. And that beats what State Farm is telling me about their policy. However, there are some really risk averse people out there. They just can’t stomach the idea that 2009 happens. Okay. Let’s compare a Roth portfolio (keeping the tax benefits) 100% in perfectly stable bonds paying 3% per year to the 10 Pay Insurance plan. Here, I’ll decrease commissions to $10 per year (since I’m just buying the bonds once a year, instead of having to rebalance between two investments), but continue the $216 term life insurance premium. 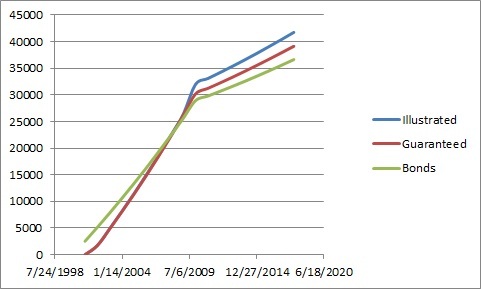 In the first few years the bonds win, since it takes time for significant cash value to build up in the insurance policies, but you have 100% access to all your contributions immediately with the bonds – but that reverses by year 8 (for the illustrated case) or 9 (for the guaranteed case). Add to that, again, that in terms of immediately ACCESSIBLE value, the insurance policies obviously win around year 7 or so, as their cash value has grown past what has been contributed to the bonds in the Roth IRA at that point. AND that the term policy paired with the Roth is going to run out in 12 years (and require continuing premium payments in that time) while the whole life policies’ death benefit will never go away and might grow. Weirdly, writing this blog entry led me in a direction I didn’t expect. I expected to conclude with something like “An 80% stock/20% bond Roth provides a better long run return and better short-run (less than 6 yr) access to contributions. Whole life policies really shine if you’re very risk averse – otherwise, go with a stock-heavy Roth.” Since I’m not particularly risk-averse, I figured I’d conclude that IBC/BOY was good for some people, but not for me. But, I think that conclusion isn’t *quite* right. Now, don’t get me wrong. The 80/20 Roth DOES provide a better long-run return. And it DOES provide better short-run access to contributions for the first 6 years. But, there’s another possibility I hadn’t considered. The analysis shows that, over the long run (8-9+ years), a 10 pay policy IS an attractive alternative to super-safe investments in things like bonds, Certificates of Deposit, or savings accounts. The fact is that EVERYONE should have SOME safe investments. Why not (gradually) REPLACE your bonds and savings accounts with whole life policies’ cash value? I mean, bonds in a 401(k) or Roth IRA are long-term investments ANYWAY. And you can keep your cash emergency funds while you build up your cash value. In the grand scheme: what about combining a smaller IBC/BOY policy with a Roth that gradually turns to 100% in stocks as the policy’s cash value grows? Basically, do the 80/2o thing, but, instead of it all being in the Roth, have the 20% in “bonds” be replaced with an IBC/BOY policy. (1) Using this as a replacement for a larger life insurance policy probably wouldn’t be a great idea – so you’d still need to carry a term policy, at least until the stock portion of the Roth IRA grew enough to self-insure. (2) Early on (years 1-7 or so), you’d still want to have some bonds in the Roth, as the cash value hasn’t caught up yet. (3) You might be able to eliminate your need for a cash emergency fund. Since the purpose of a cash emergency fund is to have liquid savings available that will not lose value, the fact is that whole life insurance cash value FITS that. It just takes some time to build up. So, keep the cash emergency fund until the life insurance cash value catches up, then you can use the cash emergency fund to either buy more life insurance or to go into a Roth, 401(k), or some other riskier investment. (4) This would be most effectively done with a flexible paid-up additions rider. This allows you to buy extra paid-up life insurance on your own schedule. The insurance company will be careful to make sure that you don’t accidentally convert your life insurance into an MEC by buying too much paid-up insurance. Based on my analysis, 10 pay life insurance is best seen as a replacement for long-term (7+ year) SAFE investments.